General Characteristics: Medium in height to tall, slender, erect, maturing within 9 to 12 months, producing two or three branches; readily identified by purplish-red flecking along the entire petiole, with almost complete absence of green coloration. Petiole: 70 to 90 cm. tall, slender, slightly curved at apex, flecked with purplish-red, almost lacking in green, with narrow reddish edge, a dark reddish-purple ring at base with lilac-pink for about 3 cm. above. Leaf blade: 40 to 50 cm. long, 30 to 35 cm. wide, 35 to 45 cm. from tip to base of sinus, ovate, thin in texture, light green; margins slightly undulate; piko small, purple; veins purplish on lower surface of lobes; lobes acute with narrow sinus. Corm: Flesh white tinged with pink, especially near apex, with yellowish fibers; skin dark lilac-pink. Inflorescence: Peduncle light purplish flecked with dark reddish-purple areas at base and above constriction; spathe 14 to 17 cm. long, the lower tubular portion about 3 cm. long, light purplish flecked with dark reddish-purple at base and at constriction, the upper portion yellow, tightly rolled; spadix 4 to 5 cm. long, slender, the sterile appendage 5 to 6 mm. long. Origin, and derivation of name: Native variety; Ulaula refers to purplish-red-flecked petioles. 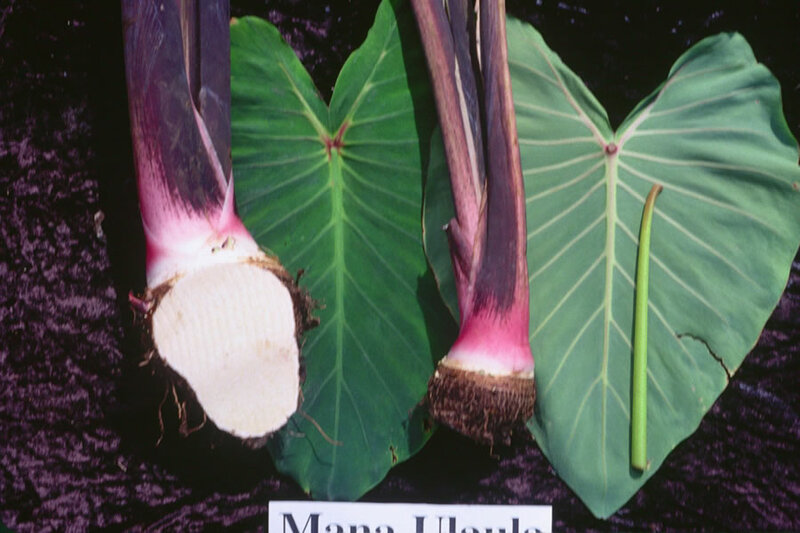 Distribution: Comparatively rare; planted in a few scattered localities on Hawaii and Maui, nearly always under upland culture. Use: Mainly as table taro for home use.